Well, I’ve finally been able to find the Aldo vs. Faber fight video on the web. Unfortunately, I’m not able to find a way to embed it here into my site. But the link below has the entire fight, in video, from beginning to end. The fight didn’t go so for Urijah Faber, who right from the beginning seemed to be outmatched by Jose Aldo. Right from the beginning, Aldo (only 23 years old) had the advantage over Faber who is obviously a great fighter. 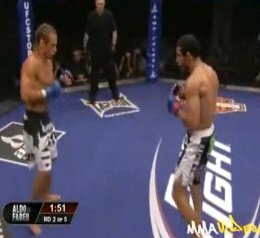 But the speed, tenacity, and powerful kicks of Aldo ended up being too much for Faber to handle after a long, 5 round battle in the cage.